Ridgewood, New Jersey (March 29, 2019) – The wait is finally over, the borders are open and El Presidente welcomes you to visit the island paradise of Tropico. 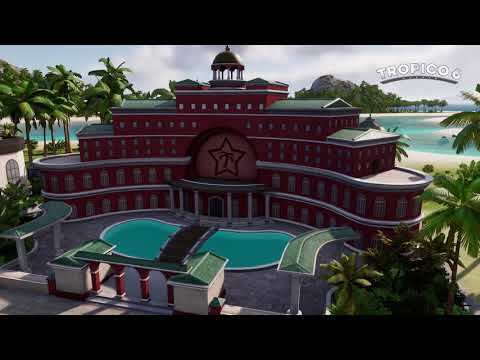 Kalypso Media and Limbic Entertainment are thrilled to announce that Tropico 6, the latest installment in the critically acclaimed Tropico franchise, launches today globally for Windows PC and Linux (with the Mac version following soon). With Penultimo busy grooming prize llama Hector for the Presidential parade to celebrate Tropico 6’s glorious launch, the loyal citizens over at Kalypso HQ have been busily editing El Presidente’s welcome trailer for your enjoyment. So click on the links below and take a sun drenched trip along Tropico’s beautiful sandy beaches and almost dormant volcanos (there’s only a 65% chance of eruption in the coming weeks) by clicking on the links below. El Presidente is back! In times of political turmoil and social unrest, the people are calling out for a visionary leader, one who will steer the fate of their country with foresight and ingenuity. Prove yourself once again as a feared dictator or peace-loving statesman on the island state of Tropico and shape the fate of your nation through four distinctive eras. Face new challenges on the international stage and always keep the needs of your people in mind. Tropico 6 is released globally via digital platforms today for Windows PC and Linux (Mac to follow soon) and as a boxed retail edition on April 2, 2019. Console versions are set to follow in summer 2019 on PlayStation®4 and Xbox One.